Cooks beautifully, looks stunning, with an incredible modern design. Might be slightly too expensive for those with smaller budgets - it is well worth the investment though. The Whirlpool GT288WH is a mid sized 25 litre combi microwave finished in a stunning modern design, with a clean and crisp white finish. The control system is dial and button based, with both being exceptionally well labelled and easy to use. In terms of size, it offers a 28cm removable turntable, which should accommodate the vast majority of large dishes. The exterior of the Whirlpool microwave measures up at 46cm by 52cm by 30cm, and overall it weighs in the region of 17kg. The colour scheme and overall styling may not suit older and traditional style kitchens - however for those who have a modern or contemporary look to their home it will fit right in. As stated earlier, our testers found it very easy to operate straight out of the box, with the controls being simple to use. Build quality is very good, as you'd expect from Whirlpool. Cooking performance was excellent, with our variety of test dishes all turning out beautifully. Quite simply the GT288WH is a stunning piece of kit - essentially it's a designer looking microwave, with exceptional performance. If you're looking for an attractive and modern microwave for your kitchen, then this is the model for you. The sleek white exterior of the Whirlpool GT288WH will match your Apple products, and works exceptionally well. Our testers were impressed with both the design, and the overall performance of this combination microwave. Well worth the money - we highly recommend this microwave. 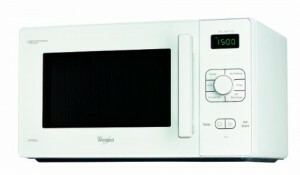 Sleek white combi microwave from Whirlpool.